JOHN SEARING. 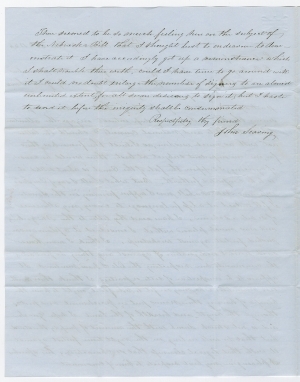 Autograph Letter Signed, to Edwin B. Morgan, February 20, 1854, Poplar Ridge, New York. 2 pp. plus integral address leaf, 7¾ x 9¾ in. 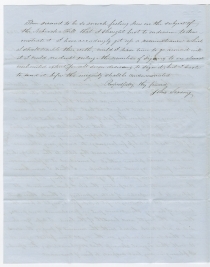 [Address:] E. B Morgan, M.C / Washington / D.C.
On January 4, 1854, Senator Stephen Douglas introduced the Nebraska Bill which sought to organize the vast Nebraska Territory (now Nebraska, South Dakota, North Dakota, and parts of Colorado and Idaho) under the principle of popular sovereignty, which allowed the territory’s residents to decide whether they wanted slavery. This would have repealed the 1820 Missouri Compromise, which prohibited slavery north of the southern border of Missouri (except for Missouri, where slavery was allowed). On January 23, an identical bill was introduced in the House of Representatives. Debate began throughout the nation. On March 4, less than two weeks after Searing wrote this letter, the Senate passed the bill by a vote of 37 to 14. When the House voted in late March to refer the bill to the Committee of the Whole as a delaying tactic, President Pierce made the act a question of Democratic party loyalty. On May 8, debate began in the House. Two weeks later, when Ohio Representative Lewis D. Campbell led a filibuster against the bill, Virginia Representative Henry A. Edmundson had to be restrained from making a violent attack. The sergeant at arms arrested Edmundson, and debate was cut off. On May 22, the House passed the bill by a vote of 113 to 100, with 21 abstentions. Morgan was one of 51 northern Whigs who voted against the bill, which President Pierce signed into law on May 30. The Society of Friends (Quakers) were the first organization to take a collective stand against both slavery and the slave trade. 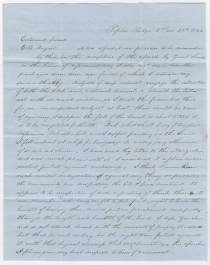 Throughout the nineteenth century, Quakers increasingly took part in antislavery activism, and Searing’s opposition to the Nebraska Bill fits in this long tradition of Quakers’ antislavery stand. John Searing (1796-1884) moved from Long Island to Poplar Ridge, Cayuga County, in 1823. He lived there until his death six decades later. A farmer, minister, and member of the Scipio Monthly Meeting, he contributed to organizations assisting African American refugees and Swarthmore College. The Friends’ Intelligencer printed a two-column tribute to him when he died. His daughter Anna Hutchinson Searing taught freed blacks in Washington, D.C., during the Civil War. She then attended medical school and became an early New York woman physician. Edwin Barber Morgan (1806-1881) became a clerk in his father’s mercantile business at age thirteen and managed it at age twenty-one. He bought and shipped agricultural products and built boats. Elected to the U.S. House of Representatives for three terms, from 1853-9, he was successively a member of the Whig, Opposition, and Republican parties. He supported high tariffs, Free Soil, and the repeal of the Fugitive Slave Act. He was a director and the first president of Wells Fargo Express Co, organized in 1852 by his neighbor Henry Wells, who had been in 1850 a founder of the American Express Company, for which Morgan also served as a director. In 1854, Morgan founded the United States Express Company to provide similar express mail services for the southern states. During the Civil War, Morgan raised and equipped New York regiments. He later served as president of Wells College from 1878 to his death, and as a trustee of Cornell University (1865-1874) and Auburn Theological Seminary (1870-1881). Old folds. 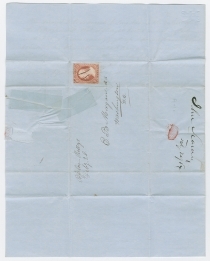 The address leaf is torn where seal was opened, with old tape repairs not affecting the letter. William H. Seward, who had been governor of New York from 1839 to 1842, represented the state in the U.S. Senate from 1849 to 1861, and was a leading opponent of the Kansas-Nebraska Act.